Garmins ECHOMAP Ultra 126sv offers a large 12-inch keyed-assist touchscreen with preloaded BlueChart g3 coastal charts and LakeVu g3 charts. Bundled with a GT54UHD transducer, you’ll enjoy Ultra High Definition Scanning Sonar Images! Built-in support for the Garmin Panoptix LiveScope System, WiFi and more! The EchoMap Ultra 126sv combo with transducer offers a navigational and sonar experience like no other. A bright 12 inch key assisted touchscreen houses exceptional mapping detail with preloaded Bluechart G3 coastal and LakeVu G3 inland maps with integrated Navionics data and Auto-Guidance technology. Share waypoints, routes and sonar data with other EchoMap Ultra 10” and 12” displays as well as EchoMap Plus 7” and 9” units giving you more flexibility. Built-in support for Panoptix LiveScope LVS12, Panoptix LiveScope System LVS32, and the entire Panoptix all-seeing sonar line (transducer sold separately) will enhance your sonar experience and bring your fishing game to a whole new level. A GT54UHD all-in-one transom mounted transducer is included with your Ultra 126sv MFD and offers CHIRP traditional and Ultra High Definition ClearVu and SideVu scanning sonar for the ultimate sonar experience. The GT54UHD transducer has the ability to provide you with sonar detail up to 2,300 ft. in freshwater and 1,100 ft. in saltwater (depending on water clarity) making this unit a great option for lake fishing or the offshore angler. Your EchoMap 126sv is equipped with QuickDraw technology which uses your included transducer to create up to 1’ contours and allow you to personalize fishing maps that tailor your needs while on the water. You can choose to keep the data stored within your EchoMap plotter or share the data you created within the Quickdraw Community, an online community where data can be shared and viewed by other users. Built-in Wi-Fi connectivity allows you to pair your EchoMap Ultra 126sv with the free Active Captain App through your smartphone or tablet, creating a connection between you and your plotter virtually anywhere on your vessel. Receive smart notifications on your plotter screen and receive notifications of when software updates are available when paired with the Active Captain App as well. Purchase the EchoMap Ultra 126sv for your next fishing adventure, you won’t be disappointed! ECHOMAP Ultra 126sv with BlueChart g3 and LakeVü g3 for U.S.
Garmin ECHOMAP Ultra 126sv Specs. Panoptix LiveScope System allows for real-time views of structure and fish below your boat even when motionless. With three convenient mounting options- Panoptix LiveScope suits almost any application. The Garmin NMEA 2000 Starter Kit comes with all of the parts you need to start a NMEA2000 Marine Network. The Garmin NMEA 2000 T-Connector is required for adding components to your network. It is installed on the backbone cable and uses one end of the T-Connector for the drop cable. The Garmin NMEA 2000 Male Terminator is used to begin or end the NMEA 2000 Backbone. It should be installed on one side of a Micro-Tee. Garmin NMEA 2000 Multiport T-Connector. The Garmin NMEA 2000 Power Cable is used to power your NMEA 2K network through a standard NMEA2000 T-Connector. The Garmin NMEA 2000 Female Terminator is used to begin or end the NMEA 2000 Backbone. It should be installed on one side of a Micro-Tee. The Garmin GPS 19x NMEA 2000 Antenna is a highly-sensitive GPS Receiver that has 32-channels to provide the enhanced position accuracy, heading and speed. The Garmin GPS 19x HVS Antenna is a highly-sensitive GPS Receiver that has 32-channels to provide the enhanced position accuracy, heading and speed. Panoptix LiveScope System with Thru-Hull transducer allows for real-time views of structure and fish below your boat even when motionless. Comes with ThruHull with fairing block. This Garmin cable can be used as your NMEA 2000 backbone or drop cable. Length: 6 Meters. Connect 2 Marine Network cables end to end with the Garmin 010-10580-00 Cable Coupler. 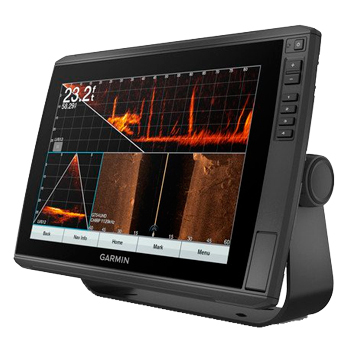 Garmin’s Panoptix Livescope LVS12 Transducer pairs with the Garmin GPSMAP 8400xsv/8600xsv models to provide a 30° forward and 30° down real-time scanning sonar view. View Fish and Structure in real time up to 200’ away from your vessel. Simple installation into the LVS port on GPSMAP 8400/8600xsv series, no external black box needed! The Garmin Marine Network Cable Connector gives you the ability to wire on the connector after you have run the cable through your boat. Sold in a pack of two. This Garmin cable can be used as your NMEA 2000 backbone cable. Length 10 Meter. This cable can not be used as a drop cable. 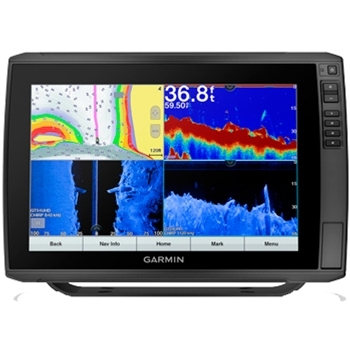 Garmins ECHOMAP Ultra 106sv offers a large 10-inch keyed-assist touchscreen with preloaded BlueChart g3 coastal charts and LakeVu g3 charts. Bundled with a GT54UHD transducer, you’ll enjoy Ultra High Definition Scanning Sonar Images! 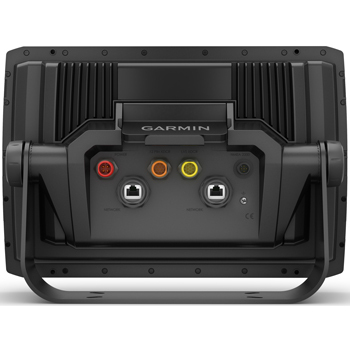 Built-in support for the Garmin Panoptix LiveScope System, WiFi and more! Garmins ECHOMAP Ultra 106sv offers a large 10-inch keyed-assist touchscreen with preloaded BlueChart g3 coastal charts and LakeVu g3 charts. Built-in support for Garmins Ultra High Def sonar, Panoptix LiveScope System, Traditional CHIRP, ClearVu, SideVu and more! *Transducers Sold Separately.